Sensible Soccer 2006 Game Review - Download and Play Free Version! Play a game of soccer whenever you want to and go for the World Cup! Play by yourself against the computer or grab a friend for an intense challenge. Enjoy this remake of the classic 1990s Sensi game with up-to-date graphics and even more exciting gameplay! Choose from 350 teams from around the world and play 50 Preset Competitions or create and customize your own team in Custom Team mode. On the field, you will automatically control the player closest to the ball and that player will continually change. Run, sprint and kick the ball with three different types of kicks. With the screaming crowd in the background, you'll feel like you really are a soccer star! With this game, you can get an exciting game of soccer going day or night, rain or shine! This game is an awesome stress reliever and a fun way to challenge your friends and yourself. Practice creating soccer strategies to bring to the real field. Do you have what it takes to win the World Cup? Challenge yourself now with Sensible Soccer 2006! 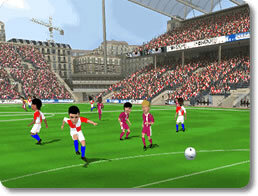 Sensible Soccer 2006 is a game that brings an arcade look and feel to soccer. It's simple enough that anyone can easily pick up and learn the game quickly. There are hundreds of teams to play, as well as the ability to create your own. You can take on friends or the computer in a variety of competitions in this game. There's plenty of fun to go around. Sensible Soccer 2006 is played just like any other soccer game. Your goal is to score points by kicking the ball into the opponents net, without letting them do the same. 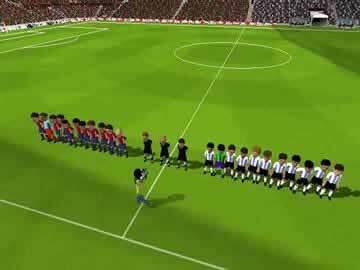 All the rules are the same as any typical soccer game. Fouls will be called resulting in yellow (and rarely red) cards for bad tackles, there will be free kicks, corner kicks, goal kicks, throw-ins, and more. You'll also get to watch replays for things like offside calls, tackles that earn you a card, kicks that almost score, and goals. This game may look or feel more like an arcade soccer game, but it's got an authentic soccer experience. There are hundreds of teams to play, and you can even create your own. You efforts in these modes can also unlock new items (like a different hairstyle for players). Several modes of play add some variety and something to work towards. You can play a simple friendly match between two teams, or participate in a competition (cup/tournament such as the World Cup).You even have the ability to create your own competition and pick the type and teams involved. You can also play with up to 3 other players either on the same team or the opposing team in these modes. The one thing really missing as far as modes are concerned is an option for online play. Four people trying to play on one machine can be a bit tricky, and online play adds more options and opportunities. The difficulty in Sensible Soccer 2006 is going to depend on the team you're facing. Teams with higher ratings and better players will be harder to beat than teams rated lower. It's also going to depend on the rating and players on your team. There are no difficulty settings (which would have been a nice addition), but the game provides a good level of challenge for anyone. The most frustrating part of the entire game is the controls. There aren't a ton of controls to learn or memorize and they're not difficult to use, but the way they work takes away from the fun. The biggest culprit is the automatic changing of which player you control. The game tries to change which player you control (when you aren't in possession of the ball) to the one closest to the ball and able to move (not knocked down). While this might sound helpful, it often leaves you in control of a player trailing behind the one in control of the ball. It also causes you to jump from player to player rapidly at times, making it easy to mess up or get a foul. Another issue is that you can only pass or shoot in the direction your facing. Since you move with the arrow keys, this makes it difficult to line up shots or passes, and can often cause you to shoot the ball off in the wrong direction as you try to position and kick. With enough play and practice you still do well and have some fun, but it's still annoying at times. One drawback in the game is the quality of the graphics and the sound. The game tries to bring an arcade-like soccer experience with cell-shaded graphics, but it just doesn't look that good. On top of that, the camera is zoomed out fairly far when playing, making it look even worse. It looks and feels like an arcade game, but the poor visuals can be a turn off. Another issue is the lack of sound. There's no commentary or music during games, so the only sounds you hear are the buzzing of the crowd and of the ball being kicked. Just a bit of music or something to add some variety would be a great improvement. Sensible Soccer 2006 can be a fun and exciting soccer game, if you can get past some of the issues. The controls and presentation could certainly be better, but beyond that it a solid game with a good deal to offer and entertaining to play. You can create and customize teams and competitions. A variety of unlockable items can be earned through play. Different game modes give you plenty of opportunity to take on the computer or friends. If you enjoy soccer, don't hesitate to give this game a try. Check out some footage featuring the introduction, main gameplay, and player management found in this soccer game.